I was perusing Facebook the other day and thought it was amusing the two posts that came up back to back in my feed. First was a video from the Holderness Family parodying Rhianna’s Umbrella with a song called Man Cold. It’s funny because it’s sort of true, at least in my household. When I start to feel even a little sick, I am pretty much a big baby and useless. The point of a Man Cold is that it is no worse than anyone else’s cold, but since it’s happening to me it’s WAY worse. I got a morning chuckle and even shared and tagged my wife, as I know she would both chuckle and mutter, “Amen,” when she watched it. These back to back posts caused me to wonder, do we, in full-time ministry work, sometimes suffer from the man-cold of vocations. Maybe I should begin with what I am not saying. I am definitely not saying that pastoral work is not hard. July will mark 20 years in full-time ministry for me. I look at this list and know too well how accurate and true many of these things are. It is hard work. Along those lines I am definitely not saying don’t pray for your pastors and their families. They are fellow-sheep who have been called to serve as under-shepherds. They are sinners who have experienced the love, forgiveness, and power of the gospel in their lives who are trying to help other sinners experience the love, forgiveness, and power of the gospel. Like mechanics whose cars are total wrecks, and accountants whose checkbooks are a disaster, Pastors sometimes spend so much time and energy caring for you and your family that they forget to pastor and shepherd their own families or care for their own souls with as much care and compassion. So, yes, please, pray for your pastors. But what on this list is so unique to pastors? Are you breathing? Are you over 16 years old? I can say without any exaggeration, you have been betrayed, falsely accused, or hurt by a trusted friend. What’s more, at least 97% of pastors have likely betrayed, falsely accused, or hurt members in their congregations, some of whom had considered their pastor to be a trusted friend. I personally have betrayed, falsely accused and/or hurt my wife, my four children, other pastors, and men and women I have vowed to shepherd and care for. I have had to go in tears and repentance to ask for forgiveness. Many of those relationships were restored by God’s grace. Some were not. Are we looking for grace and forgiveness for our own sin while harboring bitterness and resentment toward those who have sinned against us? What does this number mean? Does this mean that roughly seven out of ten pastors have been clinically diagnosed with depression? Or does this mean that roughly seven out of ten pastors admit that they fight against feelings of discouragement or melancholy or bitterness or resentment or emotional apathy? Again, I would venture to guess that at least half the people in our congregations would say the same thing. Are you reaching out to them? Praying for them? Helping them bear their burdens? 7,000 churches close each year. If this number is accurate it is certainly discouraging for the pastor and his family to go through this. But is it less discouraging for the members of that congregation who also must walk away from a work they too have invested time and energy and sweat and tears into? If 7,000 churches close this year it will affect roughly 7,000 pastors and their families (I am assuming—perhaps falsely—that the majority of churches that reach the point of closing have only one pastor). But if these churches that close have between four and ten other family units worshiping together, those are 28,000 to 70,000 family units who must now find a new church home. And that is assuming that the experience does not sour them to church altogether. I have two very good friends who are facing the painful reality of seeing their church home close this year. One is the pastor of his church. He is sad and frustrated and exhausted and discouraged and fighting feelings of failure as you would expect. The other is not a pastor. He has been a faithful member of his church since it began over nine years ago. He has been there through three pastors now. He, too, is sad and frustrated and exhausted and discouraged and fighting feelings of failure. What does this number represent? Pastors who have quit and left the ministry altogether? Does it include retiring pastors? Does it include pastors who had to resign because of sin or scandal? Does it include pastors who have quit and taken another calling? Does this number include part-time pastors, or does this really mean that there will be roughly 18,000 fewer pastors by the end of 2019 than there were at the beginning? Is this a national number or an international number (for that matter, are all these numbers U.S. pastors or do they take into account pastors from around the world?)? I do not deny that the pastoral ministry is one that can burn you out prematurely or chew you up unexpectedly. It is hard, very hard. But do we need padded numbers of attrition to make it sound harder than it is or is this merely “man-cold” explaining? 10% will retire as a pastor. 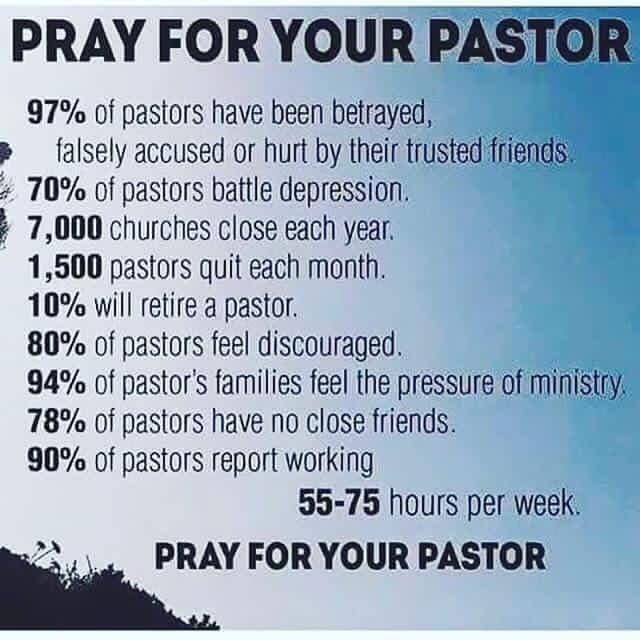 This statistic seems to be supporting the previous stat on pastors quitting (although, now I am wondering why that statistic was listed in numbers rather than percentages. Did 1500 look more dire than a percentage? Did I mention I’m a cynical Gen-X pastor?). This may be the one statistic, if accurate, that is the most concerning of all the numbers. Do churches care for their pastor’s future? Do pastor’s set aside adequate money for retiring? Certainly, as I stated before, pray for your pastors. But what are you doing in active obedience to care about your pastor and his wife when they reach the age of needing to slow down and step back? 80% of pastors feel discouraged. This feels like a repeat of the second statistic with worse numbers but a seemingly lesser struggle – discouragement rather than depression. Brothers, we are stood three feet above the crowd, have our voices amplified, recorded, and rebroadcast for potential millions on the web (potentially, millions… reality, dozens), and then told to be humble. It is no easy call. We take far too much credit for the successes of the Holy Spirit in our congregations and accept far too much blame for the failures of the flesh in our congregations. We seem to want the beginning of Moses’ ministry with signs and power and millions of followers, but not the end of Moses’ ministry with wandering and complaining and consequences for our own faithlessness. We love Paul’s theology but don’t want Paul’s personal life. This is part of the job. We are not hired hands. We do not run even when what the thief has stolen is our own joy in the gospel. We stay we love we hurt when our people are hurting. We weep when they are ensnared in sin, and we seek to restore them gently. If you are looking for a vocation free of discouragement, buy an ice cream truck. But I warn you, the retirement plan is not any better than the one you have already and the dental plan is worse. 94% of pastor’s families feel the pressure of ministry. My first question is, where in the world are the other 6% serving?! Pastor, you are doing work of eternal significance with the souls of eternal beings whose very future is in the balance. If you have raised your children to care even a little about their neighbors, they are going to be moved by the work of ministry. They are going to see you weep over friends who are throwing all away to pursue self and self-gratification. They are going to understand that life for Christ in a fallen world is hard. Is it that we want our own families to feel the pressures of ministry less, or is it perhaps that we long for 94% of the other families in our churches to feel the pressures of ministry more acutely? The church I have been privileged to pastor and shepherd is as typical as many other churches in the U.S. today. We struggle with the 80/20 balance (80% of the work seems to be done by 20% of the people). My own four children are now adult members of the church (17 years old up to 22 years old). They all still live at home or are in college and home for summers. They are four of the members in the 20% and I rejoice that they feel a holy “pressure” to be a part of the church in which they have taken vows of membership. If a surgeon or policeman or a counselor came home every evening and unloaded on his family all the trials and struggles and failures and losses of his day and they felt overwhelmed and anxious as a result, we would not say that it was because of the father’s (or mother’s) job. We would tell him he is not being wise or kind to his family to expect them to be able to handle the things that he has been trained and equipped to handle. He needs to find a healthier place to share those things. Perhaps a professional counselor. Perhaps a group of friends (which will come up next). Brothers, if your families are feeling anxious and resentment toward their church more than a love and concern for the lost and their fellow Christians and the gospel, it may not be your work that is doing that, it might be you. 78% of pastors have no close friends. What constitutes close? Pastors, are you a close friend? Allow me to paint an all too familiar picture: A family begins attending your church. They come often and somewhat regularly. Maybe they even join. Every Sunday, they arrive during the opening song and are second or third to leave after the benediction (Yes, I could have said first to leave, but if I am going to complain about hyperbolic statistics, I ought to avoid hyperbole in my rant, don’t you think?). They do not attend Sunday School or bring their children to Sunday School. They do not attend a small group. They do not attend any of the Bible Studies you offer throughout the week. Their teenager does not attend Youth Group. They do not come to potlucks or picnics or get involved at VBS. They attend for two years. And one day they tell you they are leaving. Why? They just don’t feel very connected. It’s just not a very friendly church. As a pastor doesn’t this familiar tale make you want to pull your hair out (if there’s any left), beat your head (or theirs) against a wall, and scream? You don’t feel connected? GET CONNECTED! Pastor, does your church value friendship? Do you value friendship? Is your church a place where male friendship is easy to develop? Friendships—especially close friendships—do not just happen. They must be cultivated over time and trial and error and effort and vulnerability and being hurt and hurting the other and seeking forgiveness and granting forgiveness and growing in grace together. There are two schools of thought concerning close friendships with members in the church you pastor (have them or don’t have them—I hope that was obvious. Really the only two options…). If you are not comfortable developing a close friendship with any of the members of your church, please seek out fellow pastors with whom you can relax and unwind and laugh a little too loudly or cry and scream a little too long, and they will laugh with you and they will cry with you and they will pray with you. And, for the love of all that is good, make sure you are including your wife and that she can cultivate friendships as well (both inside and outside the church). 90% of pastors report working 55-75 hours per week. I hope so. Have you asked the people in your church who work full-time jobs how much they are working? There aren’t very many 40-hour/week jobs anymore. Are you counting all the meetings you must attend as some of those hours? Are you counting your time on Sundays? You should. Of course, you should. But are these meetings that you expect some of those same full-time workers to also attend? They don’t get to count those meetings toward their work week. I’m not saying you should not rest. You must rest. You need rest. Take a day off. When you go on vacation, BE on vacation. And don’t get me started about the absolute necessity of true and actual sabbaticals for pastors. Sometimes to work on other projects for the Kingdom. Sometimes to plan and pray and consider the future of the church he is shepherding, and yes, sometimes for the very real and needed purpose of reconnecting with his Savior and his family. Here’s a helpful link to a trusted pastor (at least in my circles) on sabbaticals. I agree that working 75 hours a week is excessive if it lasts too long. But there are always going to be seasons in the church that are going to require extra work. Yes, if you try to work 75 hours a week, no matter what your job is, you will kill yourself or your wife’s will kill you or you will kill your marriage or, if you claim to be a Christian and hide behind your Christianity as the reason you work so much, you will kill your children’s love for Jesus. Accept the gift of limitations. Learn how to say no. By all means, pray for your pastor if he is a workaholic, but pray for every member of your church who has falsely put there hope for justification in their successes or accomplishments. Ministry in hard. But we do not have to make it sound harder than it actually is by man-colding our way through life. That only breeds resentment and discouragement in others in our church who are also facing equally hard times of betrayal or depression or losing their jobs or overworking or the lack of friends. Brothers, if someone sold you ministry like an Amway sales pitch, you have been sadly deceived. It is not a place for you to lock yourself in an office five days a week and read and write and blog and rant (yes, I know – self-deprecating irony is fun). You are to feed Christ’s sheep. Love and prepare and protect and serve Christ’s Bride. He died to save her. We must live to care for her. Never at the expense of your wife or your family or your health. But what on earth are we asking God’s people to do when we say they must take up their cross daily and follow Jesus if you and I are not prepared to lead the way? May we find and be better friends. May we find those who will point us to Christ when we are lost or discouraged. May we love the Church Jesus loves and find our peace and hope and strength and identity in him and his presence. Well, it is October. And along with being the month of headbands and infinity scarves and pumpkin spice lattes (Yes, I pastor in the suburbs), it is also pastor appreciation month. And although that very reality makes this post appear to be a desperate grasp for attention and plea for appreciation, I assure you it is not. But a friend of mine, who is also a pastor, is posting this month on his fb account appreciative notes about pastors he knows. Thanks, Gordon. And it got me thinking. And the thinks I was thinking seemed to stir a wind that disturbed the dust lying so prettily over this blog o’ mine. So, here I write, and here you read, and we will get to the end and decide together whether one or both of us just wasted our morning. I realized recently that in the 34 years of life before ordained ministry, I was a member of a total of three churches: 18 years at a church on the west side of Cleveland, where I was born, raised, and first understood the grace of the gospel; 6 years at a church on the north side of Baltimore, where I was trained and discipled in the doctrines of that grace; and 10 years at a church on the north side of Raleigh, where I both cut my teeth on and was the chew toy for the transforming power of the grace of God in and for real life. In those 34 years and three churches I have had… wait for it… three senior pastors (After working on the idea of this post I remembered that my pastor in Cleveland retired when I was a sophomore in high school and there was a new pastor just before my family moved to Baltimore in the middle of my senior year. But, for all intents and purposes, the starting pastor gets the win in the game of this young man’s life and the relief pastor just needed to make sure there were no walk-off home-runs by the enemy (which is not to say that this second pastor did not have his own ministry, but in the story of ‘pastors in my life,’ he gets more of a parenthetical mention (which means with the addition of this realization, I get to close this thought with not one, not two, but three closing parentheses!))). In those 34 years and three churches I have had a total of three senior pastors in my life (shoot… I suppose I should also say that the associate or assistant or youth pastors during those days had as much, and in some cases more, impact on my life and faith (I had two… one in Westlake and one in Baltimore), and this is not to diminish the importance of faithful men in those supportive roles, and perhaps one day the wind will blow and the dust will stir and I will wax long about associate pastors and waste another morning for you. But not today). Today, I want to publicly appreciate my three pastors. Two of them have fought the good fight and finished the race and have received their commendation from God himself. One, though still active in ministry, is no longer pastoring a local congregation. And While I say that I want to publicly appreciate them, I have decided to leave their names out of this. Some of you who know my history will know one or two of these men. A very few of you might know all three of them. So here are three things I am particularly grateful to these men for teaching me. This is certainly not all that I learned from these three men, but then, this is a blog not a book. Commitment that showed itself through a commitment to expository preaching and preaching through whole books of the Bible. These three men were three very different pastors. But one thing they had in common was a commitment to feed God’s people the whole counsel of God. All three of my pastors were committed to preaching the Word of God. Expository preaching is preaching a passage of Scripture and the message of that passage rather than a topic or a theme with supporting Scripture attached. It means a commitment to studying God’s Word, knowing God’s Word, loving God’s Word, and giving God’s Word to God’s people. Their commitment to God’s Word did not stop at expository preaching, but also extended to preaching through whole books of the Bible, chapter by chapter. Because of these men and their commitment to faithful expository preaching, I have learned to love God’s word and value what God wants to say to his people more than what I might want to say to God’s people. Again, that love showed itself in very different ways. One pastor was tickled whenever the bulletin announced a week full of different activities a member could get involved in at the church. One pastor was committed to training up elders to be the partners with the pastor in shepherding and caring for the spiritual needs of the church. One pastor was committed to training church planters and starting new churches even if it felt like it was at the expense of his own church’s size and reputation. These men loved Christ’s Bride and considered their callings to be that of caring for her and preparing her for her returning Bridegroom. These pastors also taught me that a pastor never outgrows his own need for and dependence on the grace of God. Pastor’s can feel snubbed and underappreciated (except in October, obviously). They can be misunderstood and challenged in their leadership. They can fight against depression and anxiety, and ego and anger. Their families can be sources of strength and comfort, and they can be sources of pain and sorrow. The day a pastor forgets that he is the chief of sinners (1 Timothy 1.15), the least of all the saints (Ephesians 3.8), and insufficient in himself to shepherd God’s people (2 Corinthians 2.16), is the day his ministry begins to die. So, thank you to my pastors. You were faithful to God’s Word, faithful to God’s church, and faithful to God’s grace. Maybe not perfectly, but then, even (and especially) through your weaknesses, Christ shined through. I pray that my own ministry is a reflection of what I learned from you, heard from you, saw in you. A marker of true belief is that we will want God’s will and we will seek God’s glory more than our own. But that leaves us with the question, even if I want to want God’s will and wished that I desired God’s glory more in my life, how do I do that? How do I cultivate a taste for God’s Glory? Let’s be honest. After all, we don’t always want God’s Glory and His will is too often the furthest thing from our desires. What are some practical steps to changing my tastes so that God’s will becomes more and more my will and God’s glory becomes more and more my chief and driving desire that sets all other desires in their proper place? Maybe an illustration would help us. When my son came home from school this Spring he announced to us that he wanted to learn to play the piano. At first I thought, “Sure. Don’t we all?” But when his older sister also came home from school he told her the same thing. He asked her if she would spend time with him teaching him the basics of piano. Now, full disclosure time. My oldest son and daughter are like any other brother and sister. They do not always see eye to eye on things. And when his sister points out things that he ought to be doing my son’s response is not always the most mature. But she agreed, and they have been spending time downstairs at the piano side by side many nights. She has been showing him some basics from old piano books she has, and he has also been spending about a half hour every day at the piano on his own. My son wanted to develop a taste for the glory of the piano. He sought out someone who already had that taste and asked for help. He also began spending his own free time seeking to develop that taste on his own. If you wanted to develop a taste for fishing you would spend time—well, fishing. You would read articles and books on fishing techniques and you would find a group of people who either already had a taste for fishing or who, like you, wanted to develop a taste and appreciation for fishing. Why is it that when it comes to our desire to grow more and more delighted in God’s will and God’s glory we expect that desire to miraculously (magically?) grow in us? How do you develop a taste for God’s glory? You spend time with others who also want that same taste cultivated in themselves. You spend time with others who already have a taste and delight in God’s will and God’s glory. You spend time reading God’s word and reading articles and books by others who have shown that they delight in God’s will and God’s glory. There are so many opportunities at Hope of Christ for just such cultivation. Our vision at Hope of Christ is to help one another know Jesus Christ, grow in grace, and go into the world with the hope of Christ. Sunday morning worship is the first of those opportunities. 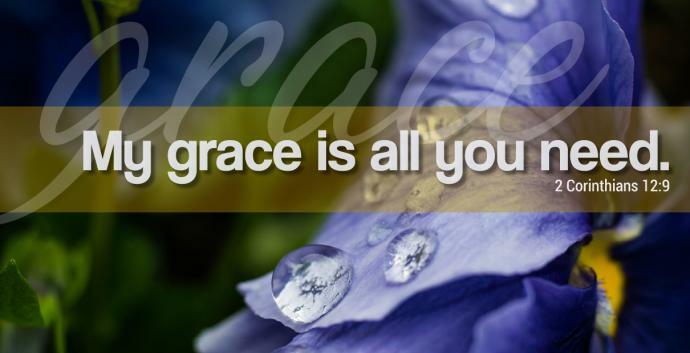 It is the one day of the week God invites us to set everything else aside and just rest in his glory and grace. Are you making Sunday worship a priority in your life? Care groups and Bible studies are another place where you can begin to cultivate your taste for God’s will and God’s glory. Even our new classes, Theology Thursdays, are an excellent place to begin developing your tastes for God’s will and God’s glory. After all, it is hard to truly know a person’s desires when we don’t really know much about that person. Theology Thursdays are a great place to be reminded of who God is and why it is essential to our well-being to desire his glory and his will. If you want to start wanting God’s will, if you want to begin to be delighted in what brings God glory, you must seek out places and people where that is being cultivated regularly. Make Sunday morning worship a priority in your week. Make Bible studies and care groups a priority in your week. Spend time on your own in prayer and in God’s word. And watch as the Holy Spirit begins to change your desires and correct your tastes. Soon you will find the glory of God your goal and the desires of God your desires. I love you all. Enjoy the Journey! Rejoice in the Lord, Only? In an attempt to emphasize the attitude of Christ toward worship, I fear I overstated and went beyond even God’s thoughts on how you ought to view the rest of your life and the gifts of God in your life. While it is true that we ought to be consumed by God’s love for us, especially as displayed in Christ and on the cross, this does not mean that we cannot or even ought not find joy and delight in other smaller, even temporary gifts from God. My mother once told me about a woman in the church where I grew up. Her attitude toward ministry was that it wasn’t serving Christ if you enjoyed it. You were really only serving and ministering if it was something you didn’t like. She was my 3-4-year-old Sunday School teacher. This revelation explained a lot. Maybe none of us would go this far, but I wonder if this is not our assumption about most of the rest of life – if you are enjoying it, it is probably an idol. But is this true? Is this the attitude God wants us to have toward our work, our possessions, our endeavors? I think not. God has given to each of us certain abilities, passions, possessions, and opportunities. If these are all gifts from God, he has not given them so that we despise or ignore them, but that we might enjoy the gifts and even share them with other people. James 1.17 states, “Every good gift and every perfect gift is from above, coming down from the Father of lights with whom there is no variation or shadow due to change.” This reminder comes right after James has warned believers of the temptations and trials that come our way. He points out that these temptations don’t come from God but form our own lusts and desires. The good and perfect gifts are from God. Our wrong uses and attitudes toward those gifts are from our own lusts and desires. The answer is not to deny the goodness of the gifts nor to avoid those gifts, but to take those gifts captive for the glory of God. Psalm 104 is a great celebration of all of creation. The psalmist celebrates everything from the Sun and moon, the mountains and seas, the forests and pasturelands, the wild beasts and domestic animals, labor and toil and rest, and even oil and wine and bread. Certainly, none of the pieces of creation are delighted in as an end in themselves, but always as a means to delighting in God. But the delight is there all the same. It is good for us, and even an act of worship, when we enjoy the gifts God has given. You worship God when you enjoy your work and your abilities. You worship God when you are passionate about aspects of creation and delight to share that passion with others. Certainly, we each need to know our own hearts, and seek to keep our desires in a healthy God-honoring place and confess our lusts as the Holy Spirit exposes them. But when we enjoy our work or our hobbies or passions or any other aspect of creation we are enjoying things the way God first intended creation to be before sin affected it and the way things will one day be again when the old is passed away and the new comes. God is delighted when we find delight in his gifts as any earthly parent is delighted when the gift they give their child is enjoyed and appreciated. C. S. Lewis describes the difference between looking at a sunbeam and looking along a sunbeam and at the sun. The sunbeam has a beauty and glory in itself, but that beauty and glory are not from itself. The glory of a sunbeam comes from the sun. the beam cannot exist without the sun. The sun can easily exist without the beam. We need not deny the beauty of the beam in order to properly value the sun. Enjoy the beams of your work, your passions, your abilities, your children, your relationships. And let those beams of goodness draw your eyes upward to the Son. Look along the gift to see the Giver.